AKA Robert Sargent Shriver, Jr.
Devoutly Catholic, Sargent Shriver was inspired by the work of Dorothy Day, and said that beginning in high school and throughout his life he asked himself every evening, "What have I done to improve the lot of humanity?" While attending Yale he became a founding member of the America First Committee, a 1930s pacifist group, but when America was drawn into the Second World War he promptly enlisted in the Navy. After the war he earned his law degree, worked as a lawyer and marketing executive, and headed the National Conference on Prevention and Control of Juvenile Delinquency in the late 1940s. Later, as president of the Chicago Board of Eduction, he laid out the city school district's first desegregation plans in the late 1950s. He was a key behind-the-scenes player in the 1960 Presidential campaign of his brother-in-law, John F. Kennedy. Beginning in 1961, at Kennedy's request, he served as the founding Director of the Peace Corps, leading the new organization's endeavor to send Americans as volunteer helpers in impoverished nations, and fending off Congressional efforts to encumber the Peace Corps with a Cold War anti-Soviet mandate. After Kennedy's assassination Shriver became an informal and later formal advisor to President Lyndon B. Johnson, spearheading the new administration's high-level talent hunt for cabinet posts and leadership appointments, and acting as "commanding general" in Johnson's sweeping "war on poverty" agenda — including the creation of Head Start, Job Corps, and Volunteers in Service to America (VISTA). He also presided over the Paris Peace Talks, which sought to end America's involvement in the Vietnam War. At the close of the Johnson administration and for the first year of Richard M. Nixon's presidency, he served as US Ambassador to France. He was Senator George McGovern's Vice Presidential running mate on the 1972 Democratic ticket, filling in after Senator Thomas Eagleton, McGovern's first choice, was forced to withdraw. Later in that decade, Shriver worked with the Kennedy Institute of Ethics to establishe what were called the "Trialogue", a series of meetings between Middle Eastern Christian, Jewish and Muslim leaders. His wife, Eunice Kennedy Shriver, founded the Special Olympics in 1968, and Shriver was President of that organization in the 1980s. 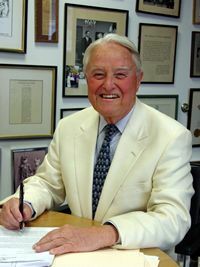 The National Center on Poverty Law was re-named in his honor in 1995, and is now the Sargent Shriver National Center on Poverty Law. He is also the namesake of an annual award for outstanding contributions to justice, the Sargent Shriver Award for Equal Justice. He died in 2011, at the age of 95. Our Lady of Mercy Church, Potomac, MD.